As you can see from my last two posts, I’m kind of in a detox mode and for good reason! Last Thursday was the beginning of a 30 Day Detox that I’m very fortunate to be leading for 16 very brave and dedicated people. Since it is a whole body detox, it includes steps for detoxifying the liver which works many hours overtime and is not to be ignored. 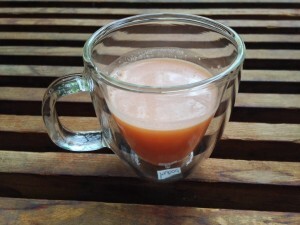 The surprisingly delicious little liver detox cocktail, featured here, is one of my favorite recipes that is included in the detox notebook. 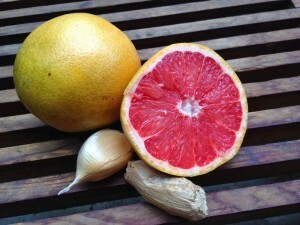 The sweetness and tang from the grapefruit and the spiciness of the garlic and ginger makes this a truly savory drink that heals as well as satisfies your taste buds. Throw all of these ingredients into your blender to make a mouth watering lil cocktail that will make your liver and gallbladder sing! Blend for a quick minute until just a little bit frothy. A little more about our detox powerhouse…. The Liver is one of our most resilient organs with the job of clearing out the toxins and trash that accumulate in our bodies from the environment, the processed foods that we eat and variety of OTC and prescription medications that are so readily at our disposal. How do you know if your liver is overworked and under supported? Do you perhaps have high cholesterol, high triglycerides, gallstones, poor fat absorption, excess estrogen, Parkinson’s or Alzheimers, or elevated homocysteine levels or liver enzymes?